Stamping je veselý a elegantný spôsob ako nechať svoje nechty rozprávať. S paletkami MoYou-London nechať rozprávať celý príbeh. O láske. (Let´s talk about love.) Namiesto klasických paletiek, ktoré ponúkajú len určitý počet obrázkov, ich má paletka Mother Nature 01 nespočetné množstvo. Koľko a aké, záleží na uhle pohľadu. Mother nature kolekcia je navrhnutá tak, aby ste mohli opečiatkovať každý necht inak, ale celá ruka by vo finále poskytla zmysluplný obrázok. Takéto originálne paletky zoženiete Iba v eshope MoYou-London za £4.99. Stamping is cheerful and elegant way to let your nails speak. With the image plates from MoYou-London let talk whole story. Let's talk about love. Instead of classic image plates, they offer only a certain number of images, the palette Mother Nature 01 has images countless. How many and which, depending on the viewing angle. 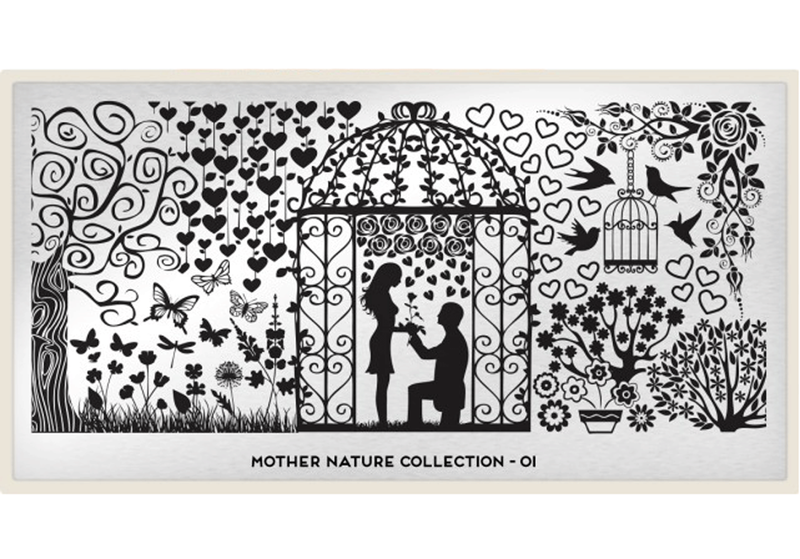 Mother nature collection is designed to be able to stamp every nail differently, but the whole hand would provide in the final meaningful image. Such an original image plates you´ll get only in MoYou-London eshop for £4.99. Teraz vám ukážem, ako paletky používať a čo k stampingu potrebujete – paletku (ja som použila paletku 01 z Rebel kolekcie, ktorá obsahuje 32 rôznych fúzikov; zoženiete tu), dva rôznofarebné laky, pečiatkovač a stierač (zoženiete tu). Ako prvé nalakujte nechty podkladovým a farebným lakom (ja nedám dopustiť na UV lak na nechty, vydrží 2 týždne). Stiahnite z paletky ochrannú modrú fóliu, na vybraný obrázok naneste farebný lak (použila som čierny lak na nail art od Essence), prejdite po obrázku stieračom, aby ste odstránili prebytočné množstvo laku. Priložte pečiatkovač na obrázok a pritlačte. Obrázok sa otlačí na pečiatkovač. Priložte pečiatkovač na necht a znovu pritlačte. A je to. Obrázok je na nechte. Celý proces by nemal trvať dlhšie než pár sekúnd, aby vám lak nezaschol na paletke alebo na pečiatkovači. Inak ho budete musieť odstrániť odlakovačom a celý process zopakovať znovu. Nakoniec prelakujte nechty vrchným transparentným lakom. Ak vám je stále málo, vyšperkujte sa fúzikovským prsteňom z eshopu mignon mignon. Now I will show you how to use the image plates and what do you need for stamping - image plate (I used 01 of the Rebel collection, which contains 32 different cute mustaches and you'll get here), two different nail polishes, stamp and scraper (you'll get here). First paint your nails with base and color nail polish (I swear on UV nail polish, which last two weeks). Take off from image plate the blue protective film, apply nail polish on the selected image (I used black nail polish for the nail art from Essence), scroll over the image with the scraper to remove the excess amount of color. Attach stamper on the image and press a little. The image is now on the stamper. Attach the stamper on the nail and press again. That's it. Image is on the place. The whole process should not take more than a few seconds, because nail polish can dry on image plate or on stamper and you'll have to remove nail polish with nail remover and repeat the whole process again. Finally, apply top transparent nail polish. If you still do not have enough of moustache, get the ring from mignon mignon. Zábavné, originálne a rýchle. Čo poviete? Alebo máte iný názor? Teším sa na vaše komentáre. It is funny, fast and original. What do you think? Or do you have a different opinion? I am looking forward to your comments. Such a nice post! It looks nice! You should try it and let me know if it really works good? I would love to go to MBFD in Zurich, but it is hard to go in, when they rather invite bloggers without interactions to publicum. Oh no! I hoped we would see each other. I'm there on Saturday! Hey there, loved your blog, just followed you on GFC (2288), would you mind to follow back? I love the final effect!!!! Really cute!!!! !